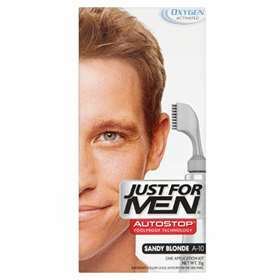 Just For Men Autostop Sandy Blonde A-10 Foolproof Hair Colour for hair that's gone completely grey or just starting to turn, this quick and easy colourant is an ideal all-in-one solution. Eliminates all Grey Hair for Up to 6 Weeks. Always work into dry hair (do not use on hair that has just been washed). For a full head of grey hair, work from front to back of the head, starting where hair is greyest. Leave for at least 10 minutes. Rinse in shower, shampoo and rinse again. Please always follow the directions provided with the product in full to ensure maximum effectiveness. Always do the allergy patch test which is provided with the product 48 hours before every application. Keep all hair colouring products out of the reach of children. If product gets in the eyes, rinse immediately. Do not use on body hair. Avoid prolonged contact with ears and face. Aqua, Cetearyl Alcohol, Steareth-21, Ceteareth-20, Parfum, Hydroxyethyl Cellulose, Ethanolamine, Manganese Sulphate,p-Aminophenol, Guar Hydroxypropyltrimonium Chloride, 1,2,4-Trihydroxybenzene, Erythorbic Acid, p-Phenylenediamine, 2-Methyl-5-Hydroxyethylaminophenol, m-Aminophenol, Sodium Sulfite, Etidronic acid.